If only June were here sooner, then I wouldn’t have to look at hydroponic greenhouse tomatoes at the Greenmarket … or be entertained by thoughts of tomato confit. Click here for a high-resolution version of this picture. If you have the time and inclination, this recipe is worth it just for the aroma. Canned organic tomatoes, along with onion, garlic and herbs are roasted at 250 F for five to six hours. The scent is redolent of summer evenings — and that’s only at the twenty minute mark. Imagine what it seems like after six hours. And if you have any experience with slow-roasted tomatoes, it will be that much more difficult to stop yourself from eating all of them at once. Exact proportions are not important. Pre-heat oven to 250 F. Pour a thin layer of olive oil into a Pyrex or earthenware baking dish. Scatter garlic, onion and herbs on top of the oil. 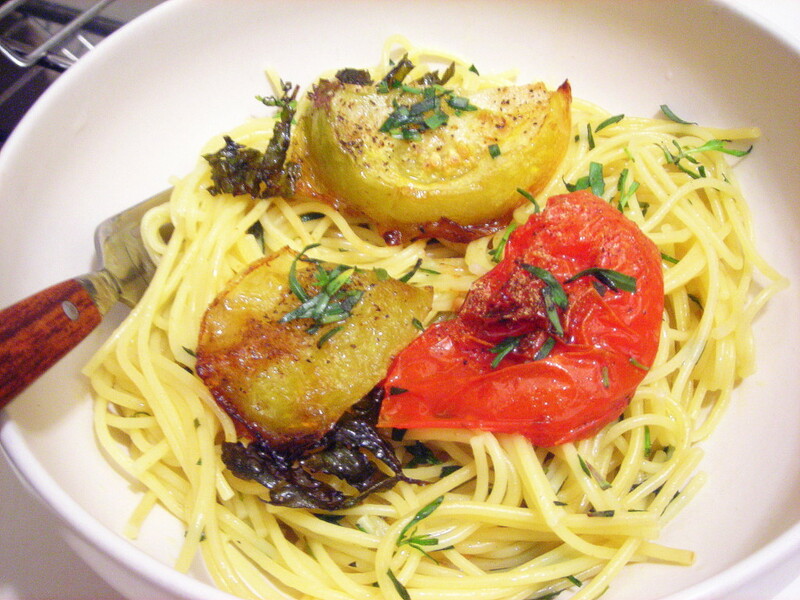 Arrange tomatoes atop the aromatics, then season with salt, pepper and sugar. Roast uncovered for five to eight hours. Remove from the oven and let cool slightly. Reserve half of the tomatoes for another use. Coarsely chop the remaining tomatoes. Meanwhile, prepare pasta according to package directions. 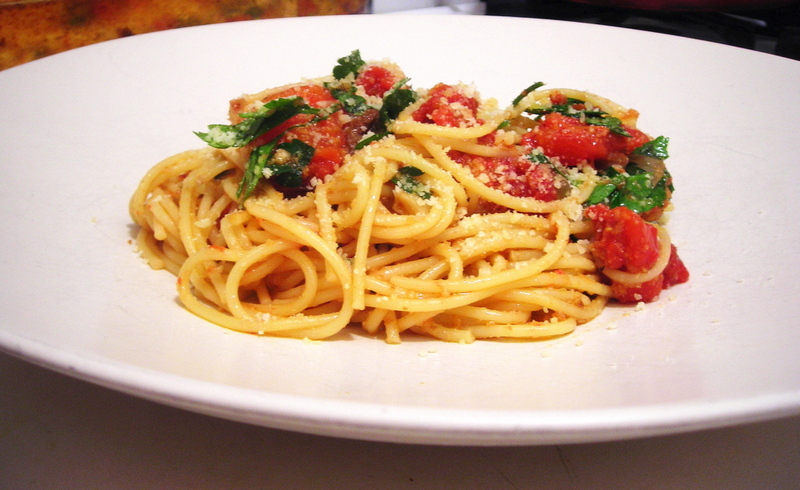 (You will most likely want to use pasta secca (dried pasta) for this recipe instead of pasta fresca but I leave that up to you.) Drain. Taste sauce for salt if necessary — it really shouldn’t need any. Add pasta directly to the roasting pan; toss to coat. My usual finishing touches include stirring in a handful of chopped herbs and/or some fried breadcrumbs (for visual, textural and flavor contrasts). Serve at once. Time: Exclusive of the roasting, 15 minutes. The tomatoes can be prepared a day ahead if logistics are an issue. * The juice is wonderful in vegetable broth or delicious all by itself. Thanks to Eggs on Sunday for some inspiration. Some of the remaining tomatoes will appear in my rendition of her Fellini Brunch dish for tomorrow evening’s dinner. 20 Apr	This entry was published on April 20, 2010 at 12:01 am. It’s filed under food, general, summer, vegan, vegetarian and tagged brunch, cooking, dinner, pasta, slow food, tomatoes, vegetarian. Bookmark the permalink. Follow any comments here with the RSS feed for this post. Ohhh, these are lovely. I love to make them, but it’s hard not to eat them like candy! When I can tear myself away, they always go straight into pasta. It’s the next best way to eating them plain, don’t you think? Pasta, crostini, sometimes as an omelette filling. They also do double duty in the winter when I don’t have any tomatoes on hand and I’m craving for a quick sauce. Try a bowl with fromage blanc, with just a teensy bit of salt and pepper.